I propose a new web-based accessible rhythm instrument called QWERTYBeats.Traditional instruments are highly accessible to blind and low-vision musicians. Electronic music production tools are not. I look at the history of accessible instruments and software interfaces, give an overview of current electronic music hardware and software, and discuss the design considerations underlying my project. Acoustic instruments give rich auditory and haptic feedback, and pose little obstacle to blind musicians. We need look no further for proof than the long history of iconic blind musicians like Ray Charles and Stevie Wonder. Even sighted instrumentalists rarely look at their instruments once they have attained a sufficient level of proficiency. Music notation is not accessible, but Braille notation has existed since the language’s inception. Also, a great many musicians both blind and sighted play entirely by ear anyway. Most of the academic literature around accessibility issues in music education focuses on wider adoption of and support for Braille notation. See, for example, Rush, T. W. (2015). Incorporating Assistive Technology for Students with Visual Impairments into the Music Classroom. Music Educators Journal, 102(2), 78–83. For electronic music, notation is rarely if ever a factor. Electronic instruments pose some new accessibility challenges. They may use graphical interfaces with nested menus, complex banks of knobs and patch cables, and other visual control surfaces. Feedback may be given entirely with LED lights and small text labels. Nevertheless, blind users can master these devices with sufficient practice, memorization and assistance. For example, Stevie Wonder has incorporated synthesizers and drum machines in most of his best-known recordings. Most electronic music creation is currently done not with instruments, but rather using specialized software applications called digital audio workstations (DAWs). Keyboards and other controllers are mostly used to access features of the software, rather than as standalone instruments. The most commonly-used DAWs include Avid Pro Tools, Apple Logic, Ableton Live, and Steinberg Cubase. Mobile DAWs are more limited than their desktop counterparts, but are nevertheless becoming robust music creation tools in their own right. Examples include Apple GarageBand and Steinberg Cubasis. Notated music is commonly composed using score editing software like Sibelius and Finale, whose functionality increasingly overlaps with DAWs, especially in regard to MIDI sequencing. DAWs and notation editors pose steep accessibility challenges due to their graphical and spatial interfaces, not to mention their sheer complexity. In class, we were given a presentation by Leona Godin, a blind musician who records and edits audio using Pro Tools by means of VoiceOver. While it must have taken a heroic effort on her part to learn the program, Leona demonstrates that it is possible. However, some DAWs pose insurmountable problems even to very determined blind users because they do not use standard operating system elements, making them inaccessible via screen readers. There are no mass-market electronic interfaces specifically geared toward blind or low-vision users. In this section, I discuss one product frequently hailed for its “accessibility” in the colloquial rather than blindess-specific sense, along with some more experimental and academic designs. 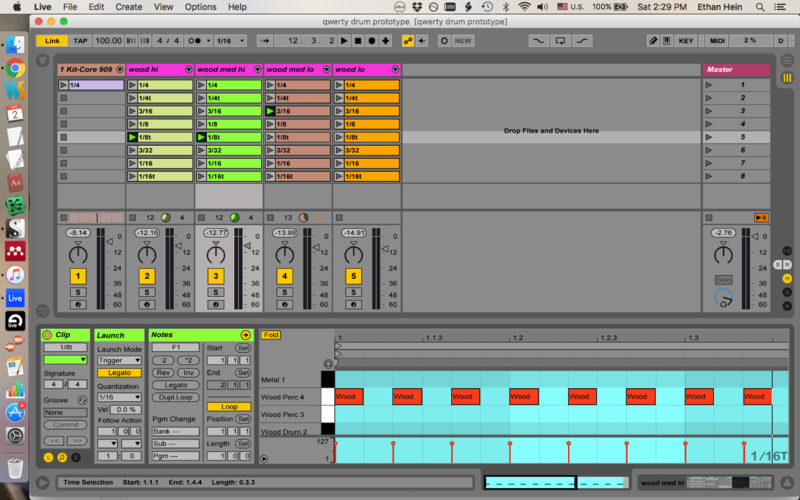 Ableton Live has become the DAW of choice for electronic music producers. Low-vision users can zoom in to the interface and modify the color scheme. However, Live is inaccessible via screen readers. 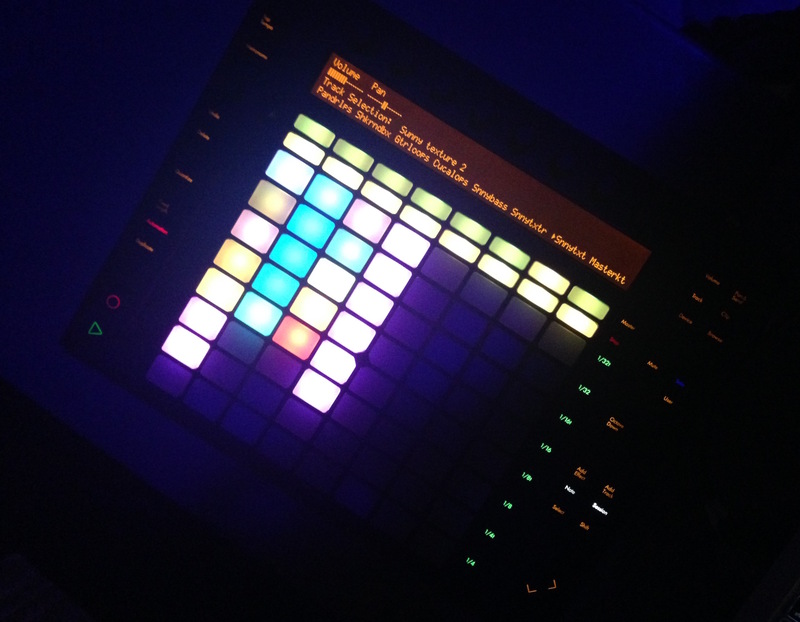 In recent years, Ableton has introduced a hardware controller, the Push, which is designed to make the software experience more tactile and instrument-like. The Push combines an eight by eight grid of LED-lit touch pads with banks of knobs, buttons and touch strips. It makes it possible to create, perform and record a piece of music from scratch without looking at the computer screen. In addition to drum programming and sampler performance, the Push also has an innovative melodic mode which maps scales onto the grid in such a way that users can not play a wrong note. Other comparable products exist; see, for example, the Native Instruments Maschine. There are many pad-based drum machines and samplers. Live’s main differentiator is its Session view, where the pads launch clips: segments of audio or MIDI that can vary in length from a single drum hit to the length of an entire song. Clip launching is tempo-synced, so when you trigger a clip, playback is delayed until the start of the next measure (or whatever the quantization interval is.) Clip launching is a forgiving and beginner-friendly performance method, because it removes the possibility of playing something out of rhythm. Like other DAWs, Live also gives rhythmic scaffolding in its software instruments by means of arpeggiators, delay and other tempo-synced features. The Push is a remarkable interface, but it has some shortcomings for blind users. First of all, it is expensive, $800 for the entry-level version and $1400 for the full-featured software suite. Much of its feedback is visual, in the form of LED screens and color-coded lighting on the pads. It switches between multiple modes which can be challenging to distinguish even for sighted users. And, like the software it accompanies, the Push is highly complex, with a steep learning curve unsuited to novice users, blind or sighted. Most DAWs enable users to perform MIDI instruments on the QWERTY keyboard. The most familiar example is the Musical Typing feature in Apple GarageBand. Musical Typing makes it possible to play software instruments without an external MIDI controller, which is convenient and useful. However, its layout counterintuively follows the piano keyboard, which is an awkward fit for the computer keyboard. There is no easy way to distinguish the black and white keys, and even expert users find themselves inadvertantly hitting the keyboard shortcut for recording while hunting for F-sharp. The aQWERTYon is a web interface developed by the NYU Music Experience Design Lab specifically intended to address the shortcomings of Musical Typing. The aQWERTYon is a completely tactile experience. Sighted users can carefully match keys to note names using the screen, but more typically approach the instrument by feel, seeking out patterns on the keyboard by ear. A blind user would need assistance loading the aQWERTYon initially and setting the scale and root note parameters, but otherwise, it is perfectly accessible. The present project was motivated in large part by a desire to make exploration of rhythm as playful and intuitive as the aQWERTYon makes exploring chords and scales. After it is set up and configured, Soundplant can be as effortlessly accessible as the aQWERTYon. However, it does not give the user any rhythmic assistance. Drumming in perfect time is an advanced musical skill, and playing drum machine samples out of time is not much more satisfying than banging on a metal bowl with a spoon out of time. An ideal drum interface would offer beginners some of the rhythmic scaffolding and support that Ableton provides via Session view, arpeggiators, and the like. Drum machines and their software counterparts offer an alternative form of rhythmic scaffolding. The user sequences patterns in a time-unit box system or piano roll, and the computer performs those patterns flawlessly. The MusEDLab‘s Groove Pizza app is a web-based drum sequencer that wraps the time-unit box system into a circle. The Groove Pizza was designed to make drum programming more intuitive by visualizing the symmetries and patterns inherent in musical-sounding rhythms. However, it is totally unsuitable for blind or low-vision users. Interaction is only possible through the mouse pointer or touch, and there are no standard user interface elements that can be parsed by screen readers. Before ever considering designing for the blind, the MusEDLab had already considered the Groove Pizza’s limitations for younger children and users with special needs: there is no “live performance” mode, and there is always some delay in feedback between making a change in the drum pattern and hearing the result. We have been considering ways to make a rhythm interface that is more immediate, performance-oriented and tactile. One possible direction would be to create a hardware version of the Groove Pizza; indeed, one of the earliest prototypes was a hardware version built by Adam November out of a pizza box. However, hardware design is vastly more complex and difficult than software, so for the time being, software promises more immediate results. This experimental interface is described in Haenselmann, T., Lemelson, H., & Effelsberg, W. (2011). A zero-vision music recording paradigm for visually impaired people. Multimedia Tools and Applications, 5, 1–19. The authors create a new mode for a standard MIDI keyboard that maps piano keys to DAW functions like playback, quantization, track selection, and so on. They also add “earcons” (auditory icons) to give sonic feedback when particular functions have been activated that normally only give graphical feedback. For example, one earcon sounds when recording is enabled; another sounds for regular playback. This interface sounds promising, but there are significant obstacles to its adoption. While the authors have released the source code as a free download, that requires a would-be user to be able to compile and run it. This is presuming that they could access the code in the first place; the download link given in the paper is inactive. It is an all-too-common fate of academic projects to never get widespread usage. By posting our projects on the web, the MusEDLab hopes to avoid this outcome. Learning by doing is better than learning by being told. Learning is not something done to you, but rather something done by you. You do not get ideas; you make ideas. You are not a container that gets filled with knowledge and new ideas by the world around you; rather, you actively construct knowledge and ideas out of the materials at hand, building on top of your existing mental structures and models. The most effective learning experiences grow out of the active construction of all types of things, particularly things that are personally or socially meaningful, that you develop through interactions with others, and that support thinking about your own thinking. If an activity’s challenge level is beyond than your ability, you experience anxiety. If your ability at the activity far exceeds the challenge, the result is boredom. Flow happens when challenge and ability are well-balanced, as seen in this diagram adapted from Csikszentmihalyi. Music students face significant obstacles to flow at the left side of the Ability axis. Most instruments require extensive practice before it is possible to make anything that resembles “real” music. Electronic music presents an opportunity here, because even a complete novice can produce music with a high degree of polish quickly. It is empowering to use technologies that make it impossible to do anything wrong; it frees you to begin exploring what you find to sound right. Beginners can be scaffolded in their pitch explorations with MIDI scale filters, Auto-Tune, and the configurable software keyboards in apps like Thumbjam and Animoog. Rhythmic scaffolding is more rare, but it can be had via Ableton’s quantized clip launcher, by MIDI arpeggiators, and using the Note Repeat feature on many drum machines. My project takes drum machine Note Repeat as its jumping off point. When Note Repeat is activated, holding down a drum pad triggers the corresponding sound at a particular rhythmic interval: quarter notes, eighth notes, and so on. On the Ableton Push, Note Repeat automatically syncs to the global tempo, making it effortless to produce musically satisfying rhythms. However, this mode has a major shortcoming: it applies globally to all of the drum pads. To my knowledge, no drum machine makes it possible to simultaneously have, say, the snare drum playing every dotted eighth note while the hi-hat plays every sixteenth note. Each row of the keyboard triggers a different drum/beatbox sound (e.g. kick, snare, closed hi-hat, open hi-hat). Each column retriggers the sample at a different rhythmic interval (e.g. quarter note, dotted eighth note). Circles dynamically divide into “pie slices” to show rhythmic values. The rhythm values are shown below by column, with descriptions followed by the time interval as shown as a fraction of the tempo in beats per minute. By simply holding down different combinations of keys, users can attain complex syncopations and polyrhythms. If the app is synced to the tempo of a DAW or music playback, the user can perform good-sounding rhythms over any song that is personally meaningful to them. The column layout leaves some unused keys in the upper right corner of the keyboard: “-“, “=”, “[“, “]”, “”, etc. These can be reserved for setting the tempo and other UI elements. Keyboard shortcuts enable the user to select a sound, audition it, record, set start and end point, and set its volume level. A login/password system enables users to save kits to the cloud where they can be accessed from any computer. Kits get unique URL identifiers, so users can also share them via email or social media. It is my goal to make the app accessible to users with the widest possible diversity of abilities. All user interface elements can be accessed via the keyboard: tab to change the keyboard focus, menu selections and parameter changes via the up and down arrows, and so on. The present thought is to divide up the screen into a grid mirroring the layout of the QWERTY keyboard. User testing will determine whether this will produce a satisfying experience. I created a prototype of the app using Ableton Live’s Session View. There is not much literature examining the impact of drum programming and other electronic rhythm sequencing on students’ subsequent ability to play acoustic drums, or to keep time more accurately in general. I can report anecdotally that my own time spent sequencing and programming drums improved my drumming and timekeeping enormously (and mostly inadvertently.) I will continue to seek further support for the hypothesis that electronically assisted rhythm creation builds unassisted rhythmic ability. In the meantime, I am eager to prototype and test QWERTYBeats. In a previous post, I used the Groove Pizza to visualize some classic hip-hop beats. But the kids are all about trap beats right now, which work differently from the funk-based boom-bap of my era. From the dawn of jazz until about 1960, African-American popular music was based on an eighth note pulse. The advent of funk brought with it a shift to the sixteenth note pulse. Now we’re undergoing another shift, as Southern hip-hop is moving the rest of popular music over to a 32nd note pulse. The tempos have been slowing down as the beat subdivisions get finer. This may all seem like meaningless abstraction, but the consequences become real if you want to program beats of your own. Back in the 90s, the template for a hip-hop beat looked like a planet of 16th notes orbited by kicks and snares. Click the image below to hear a simple “planet funk” pattern in the Groove Pizza. Each slice of the pizza is a sixteenth note, and the whole pizza is one bar long. You can hear the sixteenth note hi-hat pulse clearly in “So Fresh So Clean” by OutKast. Trap beats have the same basic skeleton as older hip-hop styles: a kick on beat one, snares on beats two and four, and hi-hats on some or all of the beats making up the underlying pulse. However, in trap, that pulse is twice as fast as in 90s hip-hop, 32nd notes rather than sixteenths. This poses an immediate practical problem: a lot of drum machines don’t support such a fine grid resolution. For example, the interface of the ubiquitous TR-808 is sixteen buttons, one for each sixteenth note. On the computer, it’s less of an issue because you can set the grid resolution to be whatever you want, but even so, 32nd notes are a hassle. So what do you do? The trap producer’s workaround is to double the song tempo, thereby turning sixteenths into effective 32nds. To get a trap beat at 70 beats per minute, you set the tempo to 140. Your 808 grid becomes half a bar of 32nd notes, rather than a full bar of sixteenths. And instead of putting your snares on beats two and four, you put them on beat three. Here’s a generic trap beat I made. Each pizza slice is a 32nd note, and the whole pizza is half a bar. Trap beats don’t use swing. Instead, they create rhythmic interest through syncopation, accenting unexpected weak beats. On the Groove Pizza, the weak beats are the ones in between the north, south, east and west. Afro-Cuban music is a good source of syncopated patterns. The snare pattern in the last quarter of my beat is a rotation of son clave, and the kick pattern is somewhat clave-like as well. Now let’s take a look at two real-life trap beats. First, there’s the inescapable “Trap Queen” by Fetty Wap. The beat has an appealing symmetry. In each half bar, both the kick and snare each play a strong beat and a weak beat. The hi-hat pattern is mostly sixteenth notes, with just a few thirty-second notes as embellishments. The location of those embellishments changes from one half-bar to the next. It’s a simple technique, and it’s effective. My other real-world example is “Panda” by Desiigner. Here’s the beat on the GP, once again simplified a bit. To make authentic trap beats, you’ll need a more full-featured tool than the Groove Pizza. For one thing, you need 64th notes and triplets. Also, trap isn’t just about the placement of the drum hits, it’s about specific sounds. In addition to closed hi-hats, you need open hi-hats and crash cymbals. You want more than one snare or handclap, and maybe multiple kicks too. And you’d want to be able to alter the pitch of your drums too. The best resource to learn more, as always, is the music itself. The Ed Sullivan Fellows program is an initiative by the NYU MusEDLab connecting up-and-coming hip-hop musicians to mentors, studio time, and creative and technical guidance. Our session this past Saturday got off to an intense start, talking about the role of young musicians of color in a world of the police brutality and Black Lives Matter. The Fellows are looking to Kendrick Lamar and Chance The Rapper to speak social and emotional truths through music. It’s a brave and difficult job they’ve taken on. Eventually, we moved from heavy conversation into working on the Fellows’ projects, which this week involved branding and image. I was at kind of a loose end in this context, so I set up the MusEDLab’s Push controller and started playing around with it. Rohan, one of the Fellows, immediately gravitated to it, and understandably so. Rohan tried out a few drum sounds, then some synths. He quickly discovered a four-bar synth loop that he wanted to build a track around. He didn’t have any Ableton experience, however, so I volunteered to be his co-producer and operate the software for him. We worked out some drum parts, first with a hi-hat and snare from the Amen break, and then a kick, clap and more hi-hats from Ableton’s C78 factory instrument. For bass, Rohan wanted that classic booming hip-hop sound you hear coming from car stereos in Brooklyn. He spotted the Hip-Hop Sub among the presets. We fiddled with it and he continued to be unsatisfied until I finally just put a brutal compressor on it, and then we got the sound he was hearing in his head. While we were working, I had my computer connected to a Bluetooth speaker that was causing some weird and annoying system behavior. At one point, iTunes launched itself and started playing a random song under Rohan’s track, “I Can’t Realize You Love Me” by Duke Ellington and His Orchestra, featuring The Harlem Footwarmers and Sid Garry. Rohan liked the combination of his beat and the Ellington song, so I sampled the opening four bars and added them to the mix. It took me several tries to match the keys, and I still don’t think I really nailed it, but the hip-hop kids have broad tolerance for chord clash, and Rohan was undisturbed. Once we had the loops assembled, we started figuring out an arrangement. It took me a minute to figure out that when Rohan refers to a “bar,” he means a four-measure phrase. He’s essentially conflating hypermeasures with measures. I posted about it on Twitter later and got some interesting responses. @ethanhein possibly an artifact of working with grid based music software and loopable chunks of music. @ethanhein sure, the smallest loopable unit would generally be a complete phrase, which looks like a “bar” on the grid. In a Direct Message, Latinfiddler also pointed out that Latin music calls two measures a “bar” because that’s the length of one cycle of the clave. Thinking about it further, there’s yet another reason to conflate measures with hypermeasures, which is the broader cut-time shift taking place in hip-hop. All of the young hip-hop beatmakers I’ve observed lately work at half the base tempo of their DAW session. Rohan, being no exception, had the session tempo set to 125 bpm, but programmed a beat with an implied tempo of 62.5 bpm. He and his cohort put their backbeats on beat three, not beats two and four, so they have a base grid of thirty-second notes rather than sixteenth notes. A similar shift took place in the early 1960s when the swung eighth notes of jazz rhythm gave way to the swung sixteenth notes of funk. By the time we were done working, the rest of the Fellows had gathered around and started freestyling. The next step is to record them rapping and singing on top. We also need to find someone to mix it properly. I understand aspects of hip-hop very well, but I mix amateurishly at best. All the way around, I feel like a learn a ton about music whenever I work with young hip-hop musicians. They approach the placement of sounds in the meter in ways that would never occur to me. I’m delighted to be able to support them technically in realizing their ideas, it’s a privilege for me.